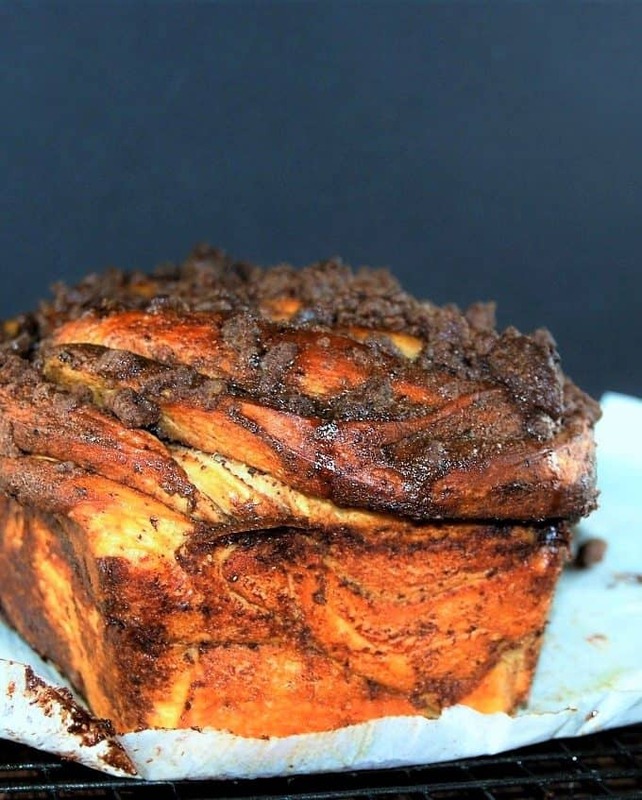 According to the New York Times, the babka is having a moment. So I wanted to have my very own moment with it. 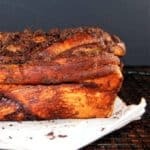 But coming up with the perfect vegan Chocolate Babka took a little longer: in fact, it took a few weeks of experimentation and trial and error and, in between, eating delicious versions of chocolate babka that were almost there but not quite. The loaf I have for you today is everything a chocolate babka should be: rich-tasting, buttery, chocolate-y, sweet without being too cloying. And it has a texture that’ll make you feel like you’ve landed on a cloud. Or are eating it. I knew I had hit on the right version when I took half a loaf of this cake to a friend’s home and the next day she confessed to me that her Jewish husband and she guzzled it all up in minutes. We didn’t even save some for Danny, she told me guiltily, referring to her eight-year-old who was in bed. 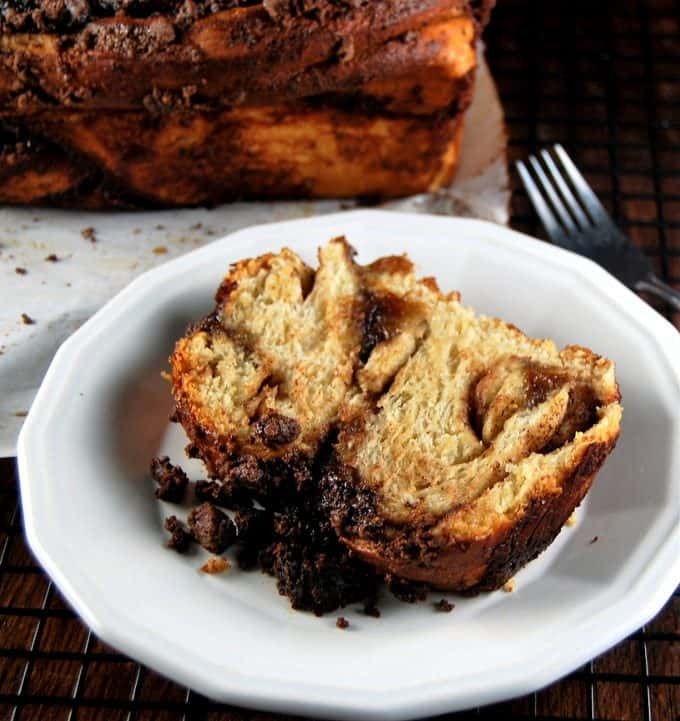 It’s easy to go nuts for babka. This cake with a brioche-like texture melts in the mouth and the many layers of flavor that go into building it, making it sweetly addictive. But a vegan babka is easier said than done. The structure of this bread is, like brioche, built with a liberal use of eggs that give the babka its characteristic airiness and lightness. 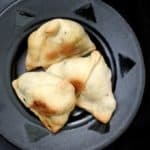 For my vegan version, I used aquafaba– that rather yucky chickpea brine that I have sent down the drain by the gallon in my past life (I do eat a lot of chickpeas, you know). After seeing everyone in the vegan world rave about it for about a year now, I did consider trying it out a few times as an egg substitute, but c’mon, chickpea brine? Wouldn’t that just make everything taste beany and salty? I do love beans, but I don’t exactly want my cake to taste like them. Lucky for me, I was wrong. 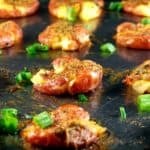 I’ve tried it in a few baked recipes so far, with great results. The aquafaba appears to leave no flavor or indeed any trace of itself (unlike eggs which create that awful smell when baked), and it does contribute to creating lightness and airiness in baked goods, just like eggs. And it’s free, at least if you eat chickpeas — and easy. The only thing you really need to remember when subbing aquafaba for eggs is to swap out each egg with three tablespoons of aquafaba. Couldn’t be simpler. The recipe I used riffed off from a very non-vegan recipe by Melissa Clark (watch her video for a good tutorial on shaping the babka). This is a time-consuming cake, with many steps: you make the dough, you make the fudgy, chocolatey filling that tastes SO AMAZING, you make the incredibly delicious streusel, and finally you make the syrup which goes on at the very end, giving the cake a glossy, beautiful look. The results make all of that work well worth it. This recipe makes two loaves, because, believe me, one’s not going to be enough. You might even want to share. Although, on second thoughts, don’t count on it. 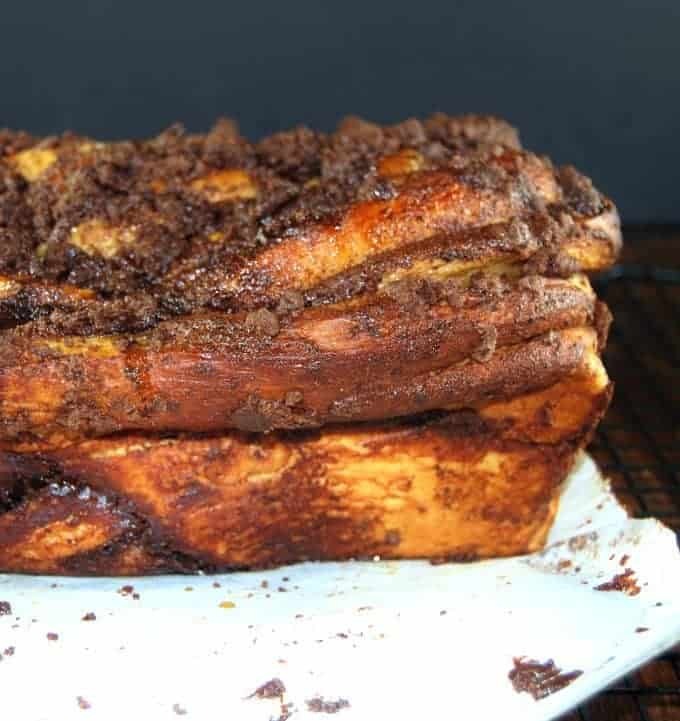 Vegan Chocolate Babka. 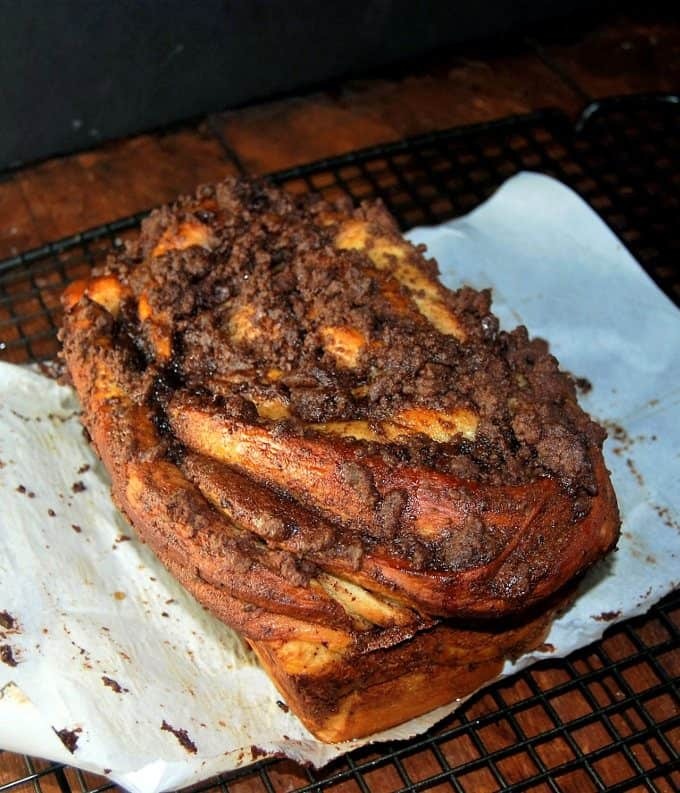 A vegan version of the brioche-like Jewish bread, Chocolate Babka. Aquafaba, or chickpea brine, replaces eggs. 1/2 cup cashews soaked for 30 minutes, then blended with 1/2 cup water until it forms a very smooth cashew cream. If needed to keep the blender blades moving, add 1 tbsp water at a time, not exceeding 4 tbsp. Mix the yeast and nondairy milk and a pinch of sugar in a bowl and set aside five minutes until it froths, indicating it's alive. Place four cups of flour in a large bowl or the bowl of a stand mixer. Add the salt, 1/3 cup sugar, lemon zest, nutmeg and vanilla and mix well. Add the yeast mixture and aquafaba and knead on medium speed until the dough comes together in a ball. If the mixture is too sticky, add flour, a tablespoon at a time, until a supple, smooth dough forms. Add half the vegan butter and knead until it's absorbed by the dough. Repeat with the other half and knead another five to six minutes until you have a very smooth, elastic dough. Make a ball of the dough and place in an oiled bowl, turning once to coat the top. Cover with plastic wrap and set aside to rise in a warm place for 2 hours. 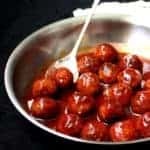 After two hours, punch the dough down, form into a ball, place into the bowl once more, cover, and place in the refrigerator overnight or at least for six hours to let the flavor develop. In a food processor, process the chocolate chips until they break down into smaller pieces. Add the flour, cocoa, salt and butter and pulse 2-3 times until the mixture comes together in large crumbs. In a small saucepan, heat the water and sugar until the sugar is completely dissolved, 2-3 minutes. You need to do this right before the babka comes out of the oven. Oil and line with parchment paper two 9-inch loaf pans. Knead the refrigerated dough briefly and divide into two. On a floured surface, take one portion of the dough and roll it out evenly into a 18 X 8 inch rectangle. Take half the fudge filling and using a spatula or a spoon, spread it evenly across the surface of the rectangle. Using your fingertips, and starting with the long side, roll the dough into a tight coil, the way you would a jelly roll. Seal the ends. Cover with a kitchen towel and place in the freezer for 10 minutes. Now take the first coil of dough out of the freezer and cut it lengthwise into half, using a sharp knife to expose the filling. 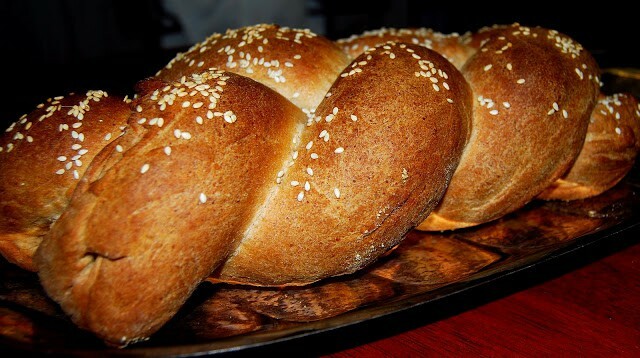 Braid the two halves and then fold them over once to make them fit into the loaf pan. Snuggle the dough into the pan. Repeat with the other coil of dough. Place the loaf pans, covered, in a warm place for 1 to 1 1/2 hours. The dough will rise but will not double. The loaves will rise further in the oven. Before the loaves go into the oven, scatter the streusel on top. Preheat the oven to 350 degrees. Bake the loaves for 50 minutes. Remove the cakes to a rack and immediately poke all over with a skewer, all the way to the bottom. Then pour on the sugar syrup, making sure you divide it evenly between the two cakes. Remove the loaves from the pan, and continue to cool them on a rack. Vaishali, You have done it again! Tell us more about aquafaba. 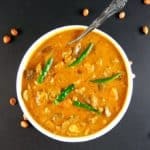 Did I use brine from canned chickpeas? How do you store it? And share more recipes where it can be used.. Please. Hi Ambica, it’s just the brine you get from cooking or canned chickpeas. I have so far only used the brine from the canned version because if making it at home you might need to pay closer attention to the water-chickpea proportion while cooking, but it’s on my to-do list to try a homemade version of aquafaba soon. I’ve used it in some vegan breads so far, and it’s been really great. It can also be whipped into a meringue, which sounds crazy, but yes, it can actually be done. I will be using it more frequently in recipes so stay tuned. I store it in the refrigerator for a week or so, but if you want to preserve it for longer, freezing would be fine. Stunning! Thanks so much for sharing this recipe. I made the fudgy sauce but it came out runny. When I blended the 1/2 cup soaked cashews (I drained them first) with 1/2 water, the cream came out really viscous. I completed the steps like instructed and the result was really liquidy. :( Of course, when I spread it onto the rolled dough, it all just oozed out. I know it would set up in the freezed but transferring it onto a pan and into the freezer will be messy. What went wrong? Please help! Thanks! Hi Lillian, It should not have become too liquid with 1/2 cup water– in fact, I find it hard to keep the blender blades running with that much water, and I think I used close to 1 cup when I made mine. Also, did you refrigerate the fudgy sauce? That thickens it up because the butter and the chocolate thicken up when they stand. You can still go ahead and braid the dough and make the bread– no one will be able to tell after the streusel is on. Hi. I didn’t refrigerate the sauce, but that is a good idea. I did make it anyway and it came out delicious! I will give it another try this weekend. Thanks for the recipe and advice! The same thing happened to me. Melissa Clark’s recipe says to use 170 g of chocolate in the filling, which is more like one full cup of choc chips not half a cup as written here. Next time I will use that much chocolate and it should be firmer and easy to work with. There will be a next time because it was delicious! Thanks Vaishali. 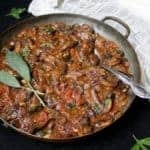 I am going to try making the sauce again and will update. Thanks for the feedback, Anon. So glad you liked it! Thank you for sharing this! I made it this morning and I cannot believe I made such a delicious tasting thing! I’m inspired to modify this recipe and make something closer to a chelsea bun or a sticky bun – yum yum! Leslie, that’s awesome. Thanks for your feedback! 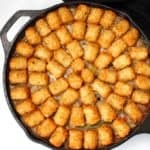 I am newly vegan and I have been looking for interesting recipes, when I saw this I knew I had to try it. It is so amazing!!! I am also a novice baker….My kids and I couldn’t believe I actually made something so delicious!!! Carol, so glad you tried! 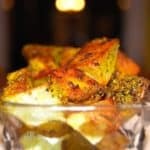 Hi Vaishali, this recipe was simply too good for words. I made this loaf last night and it did not survive until breakfast. Thanks for the great recipe. Just yum. This looks amazing! I’d love to try it, but I have a child who’s so allergic to nuts, we can’t even cook cashews in the oven. Do you know if anything else might work as a nut-free substitution? Thanks! I have not yet made this recipe (although it looks incredible and I can’t wait to try it!) but you could substitute sunflower seeds for the cashews 1:1, I work in a nut-free vegan kitchen and this is what we use in recipes that originally call for cashews. Thanks so much for sharing–made this delicious concoction this morning. Left off the streusel topping off & cut the syrup amount in half; the filling is incredible enough to satisfy my conception of what a sweet, decadent bread should be. Everything went perfectly according to the recipe specifics. I was even able to cut & shape my babkas without the 10 minute chill in the freezer (wrong shape freezer here). 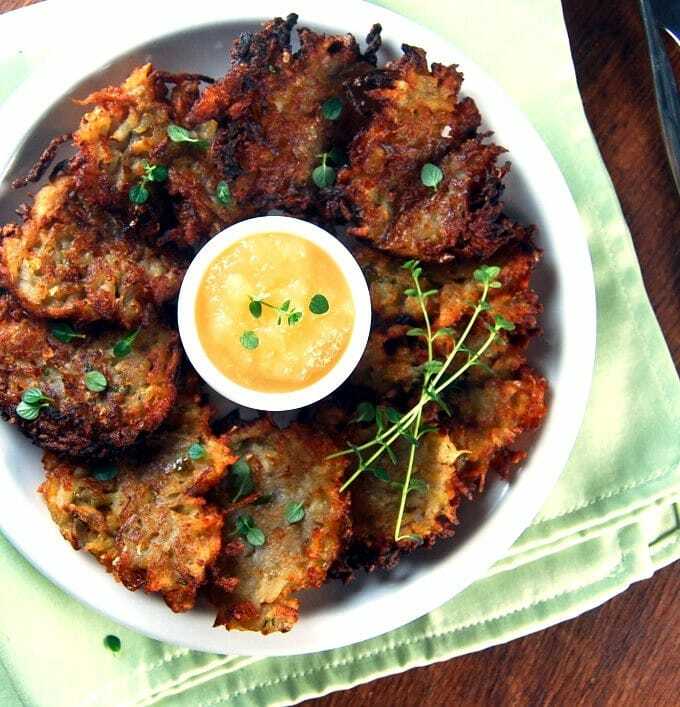 Thanks again for adapting this top notch recipe to be cruelty-free! Wondering if you ever tried making it gluten free. 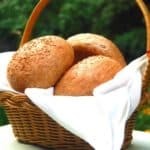 Asking for my daughter and dad that are Celiac.